Ever since I was a kid we have always called English Muffins “Round Toast”…. but for all of you to understand what the heck I’m talking about.. I have called them English Muffins in the title. They turned out great and are so quick and easy. This round toast is a great healthier homemade alternative to regular bread. No added sugar and highly processed refined flours. This recipe is also gluten-free. *microwave for 2 minutes, slice, and toast! I avoid most cereals and store bought granolas as they tend to be packed and filled with high sugar content, high fructose corn syrup, and many other unnecessary ingredients. Making my own granola to top on yogurt, nut milk, on fruit, and just for snacking is my favourite! Optional: add almonds, nuts, additional seeds, cranberries or raisins (my fav). In a small mixing bowl. Combine all the above ingredients together one at a time with regular mixing. 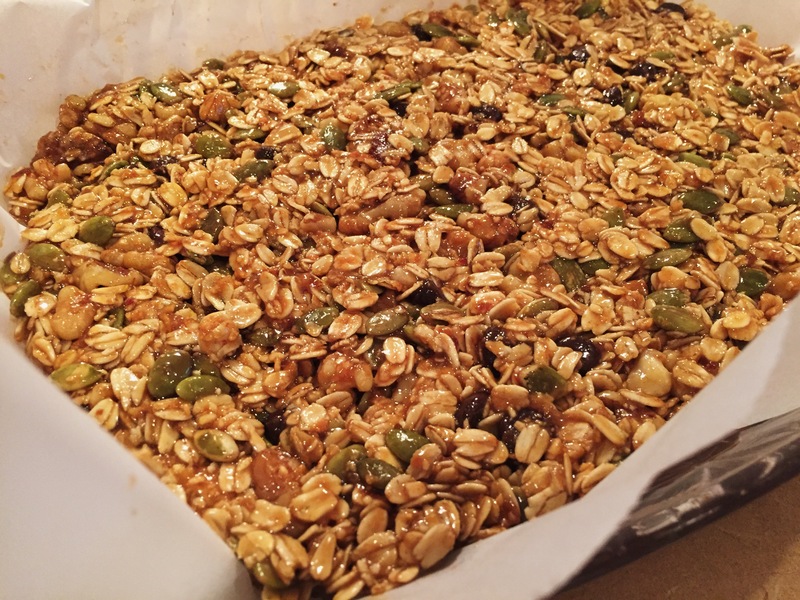 When completely mixed, spread and pack down the granola mixture onto a baking sheet lined with parchment paper. Bake for ~20 minutes until browning with regular mixing to ensure the outsides do not over cook. Remove from the oven and pack down with a spatula again. Allow to cool and harden if you would like it to be chunky. After mixing your batter thoroughly, preheat the oven to 350F. Line a muffin tin with paper muffin cups OR as I did, grease with coconut oil. 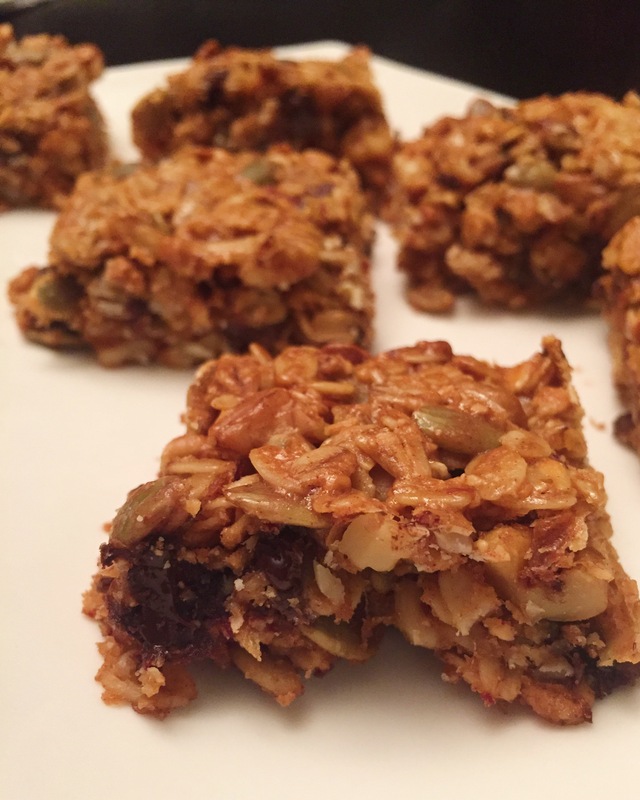 We love to have homemade healthy goodies handy at our house so that we always know we have something to grab on the go with our busy schedules. These bars are packed with healthy unsaturated fats from nuts and seeds – giving you a boost of Omega 6s! Additionally, nuts and seeds are a great source of fibre and protein helping you maintain a healthy digestive system and keep you satisfied. Let me know what you think. Feel free to experiment with swapping for different nuts and seeds. Ensure to soften dates and make into a paste. Mix into the bowl with dry ingredients. Soften the peanut butter and melt the coconut oil to add to the bowl. Mix all ingredients together. Pack into a baking pan lined with parchment paper. Bake for ~15-20 minutes until browning. Allow to cool for an hour. Place in the refrigerator. Enjoy! Store these bars in the refrigerator. The Ultimate Trail Mix Cookie! A family favourite. The appearance of these guys doesn’t do the flavour justice. MMMmmm these cookies turned out SO good and they are packed with nutrient dense ingredients (…ALOT of ingredients). 1/2 cup gluten free flour (I have used corn flour, almond flour, and quinoa flour, they all work great). In a large mixing bowl, mix together all of the dry ingredients. One by one begin to mix in the wet ingredients to the same bowl. Regularly mix. When all ingredients are mixed thoroughly together, line a large baking sheet with parchment paper. Form batter into cookies. (If you are forming them with your hands ensure to wash your hands and leave them a bit wet to avoid all the batter sticking to your hands). Bake at 350F for 15 minutes. Remove from the oven, let cool. ENJOY! 3 TBSP natural almond butter (or nut butter of choice), smooth and softened. 10 fresh dates, pitted, softened and mashed into a paste. 1 TBSP brown rice syrup (found at Bulk Barn, if you do not have this you can swap for more honey instead). Mix all dry ingredients for the oat layer together. Then begin to add in wet ingredients one at a time with stirring. Note: to soften the dates, microwave them for 40 seconds with 2TBSP water. Then mash into a paste. In a small pan lined with parchment paper, pack down the mixture to make the bottom oat layer. Now, In a small pan on the stove top. Placing the burner to medium-high heat, add blueberries, mashed banana, syrup, and honey. Bring to a boil. Once bubbling, remove from the heat and begin to stir in corn starch 1 tsp at a time. This will thicken the blueberry mixture. When you had added all the corn starch, pour and spread this layer on top of the oat layer. For the top oat layer I like to add my own personal granola at the end for a crunch: See Brooke’s Almond Granola Recipe here! Mix these ingredients together and sprinkle on top before cooking. FINAL STEP! Bake in the oven on 350F for ~20-25minutes. Until you can see the edges browning. Let cool and enjoy warm! If you are storing these to eat throughout the week I recommend storing them in the refrigerator after 1-2 days. I love KIND bars especially when I am on the move and looking for something quick and satisfying. They contain a substantial amount of nuts for healthy fats and brown rice syrup for a source of glucose (energy) for your body. So… I decided it’s about time I try to make my own home-made version. 1 tbsp quinoa flour (or gluten-free flour of choice e.g. almond meal, coconut flour, etc). Preheat oven to 300°F (149°C). Line a small pan (I used my small loaf pan for making banana bread) with parchment paper with enough overhang on the sides to easily remove the bars from the pan. Set aside. Using a rubber spatula or wooden spoon, mix the brown rice syrup, honey, vanilla, quinoa flour, salt, and nut butter together until combined. Fold in each of the dry ingredients one at a time: almonds, puffed quinoa, peanuts, cranberries, pumpkin seeds, and optional dark chocolate chunks (at least 70% cacao). Transfer mixture to prepared baking pan and press very firmly into an even layer. You really want it packed in tight- as tight as possible. Bake at 300F for 20-22 minutes. Remove from the oven and allow to cool completely in the pan set on a wire rack for 1 hour, then transfer to the refrigerator to chill for 1 more hour. This helps firm up the bars which makes them stay compact. Remove bars from the pan using the overhang on the sides and cut into bars. Individually wrap each bar in plastic wrap or parchment.